Why Gatekeeper Redundancy? – There might be few scenarios where for some reason the router might go hard down or the link. If the Gatekeeper is down, the inter-cluster calls will not work if until and unless the GK comes up. In those cases, we will configure a redundancy between the Gatekeeper so that if in case the Primary Gatekeeper goes down, secondary will take place and will continue to work and we would be able to place inter-cluster calls. When the Primary links becomes available, the traffic will switch over to primary again. This can be achieved using HSRP (Hot Standby Routing Protocol). Now the question is how? Let’s start. We have two Branch locations named as BR-1 and BR-2. The Branch locations are connected to the Gatekeeper in HQ site via a link. Now we have two Gatekeepers named as Gatekeeper-HQ1 and Gatekeeper-HQ2 connected via a switch which is required for running HSRP for redundancy purpose. BR-1 having extension range 1XXX and BR-2 having extension range 2XXX. Assuming you know the basic configuration and have done basic routing from BR-1 to BR-2. I will just provide the basic configuration used in the site. 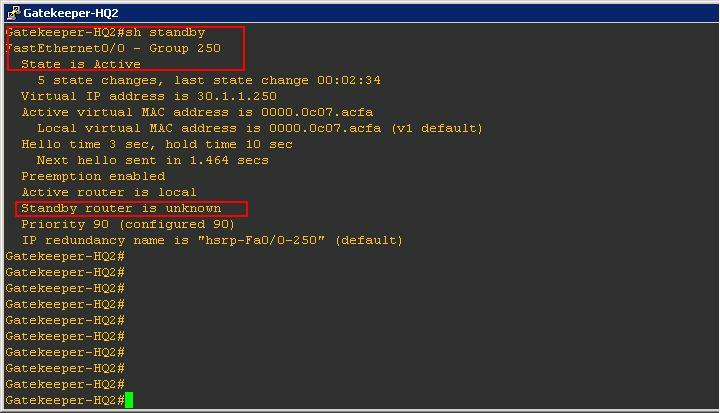 You are done with the configuration and now it’s the time to verify HSRP status. We could see the status to be up and Gatekeeper-HQ1 is Active Router and Gatekeeper-HQ2 is the Standby Router. Now we need to ensure that the calls from BR-1 (1XXX) are going through to BR-2 (2XXX) without issues. Let’s verify. We could see that a call was made from the extension 1000 to extension has been through and could see the call to be established successfully. Now we need to ensure that calls via the Gatekeeper-HQ-2 should go through if the Primary Gatekeeker-HQ1 goes down. To test this, we will shut down the link of Gatekeeper-HQ1 and verify. Let’s do it. We could see that the Gatekeeper HQ-1 is shutdown now. Now it’s time to verify if the Secondary HSRP has become Active in Gatekeeper-HQ2. We could see that a call has been established via the Gatekeeper-HQ2 even the Gatekeeper-HQ1 is down. Now we will unshut the interface at Gatekeeper-HQ1 and see if the failover happens automatically. As soon as we brought the interface back, the status of Gatekeeper-HQ1 has taken over and became active and Gatekeeper-HQ2 is standby. Hence our lab is successful.